It has been a busy few months with numerous taster dates to get the good folk of Wakey to see our services in action and experience the benefits of being outdoors in the local countryside. One week we were planting trees and the next week we were pulling them out – all in the name of conservation! 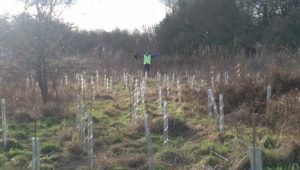 With the help of students from Wakefield College, the Tuesday Wildlife Workforce team planted 420 native saplings in Pontefract Park, as the area is in desperate need of a woodland. The trees will eventually help screen the park from the M62. Up on Seckar Wood in south Wakefield the following week, we needed to remove some of the young tree saplings as if left, they would turn the heather heathland area into woodland. 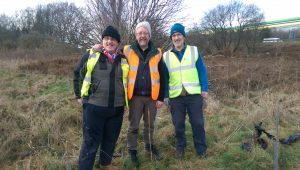 Although native woodland is good for nature, lowland heathland is one of the most declining habitats in England, so we helped the Countryside Ranger team to preserve this local reserve for the wildlife that calls it home. 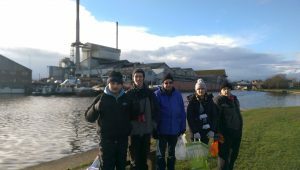 We would love to hear from you if you know a site for our conservation work party to come to, or if you would like to join this team of nature lovers. 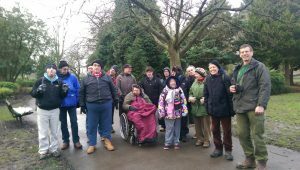 Our Wakefield Weekend Outings group had a lovely, crisp day in Pudsey Park, Leeds with some of the Harrogate team. We were celebrating the RSPB’s Big Garden Birdwatch and for the occasion, Leeds City Council had put on informative walks and activities within the visitor centre. Everybody was rather impressed when we managed to record 19 species in just over one hour, which shows how rich urban nature can be, even in a small green space like this. 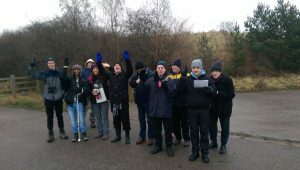 The Thursday Walking group have enjoyed several short walks over the past few months. From a blustery day wildlife watching at Ogden Water to learning about the heritage of Knottingley, if there is a gentle stroll somewhere new and a cuppa at the end of it, you can count on us to be there! 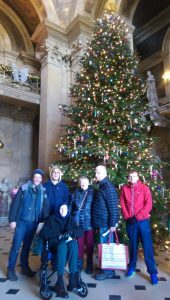 The Wakefield Tandem Club enjoyed a Santa-themed taster day at Thornes Park to get some practice in before we start heading out on a Wednesday evening come April. The next taster session is Sunday 11th March at Pugneys Country Park. Why not try something new for 2018 and give it a spin? The Wild about Wakefield project launches officially on Sunday 25th March, at National Trust Nostell. We will be joined by some of the Harrogate group and we will be celebrating all things outdoors with conservation taster sessions, walks, tandem cycling and more! To get involved in the launch, give us a bell on 01423 507227.